1 blind embossed area on Side 1 of uncoated 80lb White Fiber stock. H4 business card slits on right pocket. 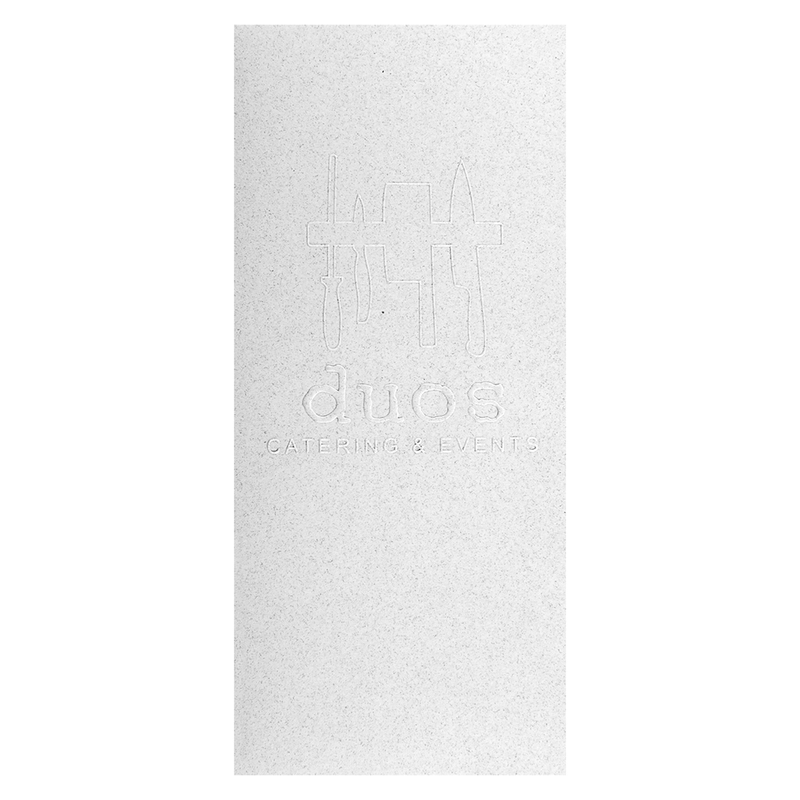 Duos reflects its passion for craft artisan food and organic farming with a finely crafted design. Embossed letters and cooking utensils give the caterer's logo a raised textural effect, helping customers create sensory memories of the brand. The White Fiber stock has a natural, organic look that alludes to the company's support of small, local farms in the Pacific Northwest. 1 foil stamped area on Side 1 of uncoated 100lb White Linen stock. H4 business card slits on right pocket. 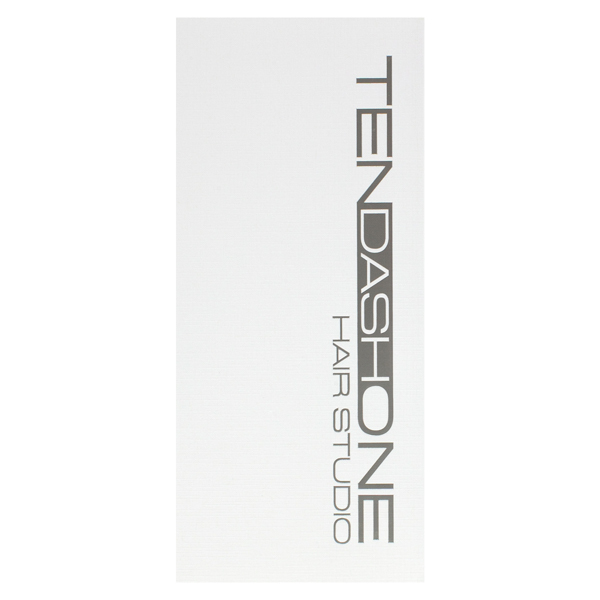 California salon Ten Dash One chose a design that's as fashion-forward as its hometown of Ventura. Stylish Metallic Platinum foil gives a little sparkle to the logo, while white panels enhance its glitzy look. Both colors suggest purity, cleanliness, and modernity—all traits embodied by a luxury salon. Side 1 printed with 2 PMS colors using heavy coverage. Side 2 printed with 1 PMS color using heavy coverage. 12pt C2S Semi-Gloss stock coated with Aqueous Satin. H4 business card slits on right pocket. 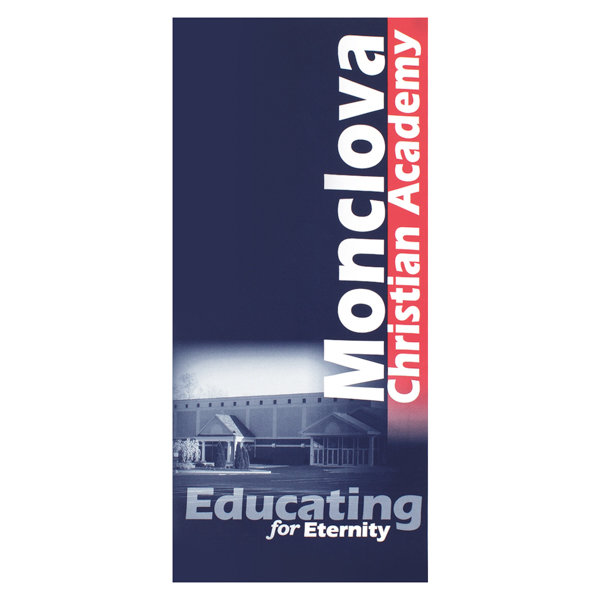 Navy blue panels reflect Monclova Christian Academy's school spirit. Its trademark blue mixes with red and white accents to lend the design a patriotic tone. Vertical type engages readers' minds and points to the cover photo. On back, Monclova's seal and contact information sit slightly off-center to create visual interest. Four-color process printed on Side 1 of 12pt C1S White Semi-Gloss stock. Coated with Aqueous Gloss. H4 business card slits on right pocket. 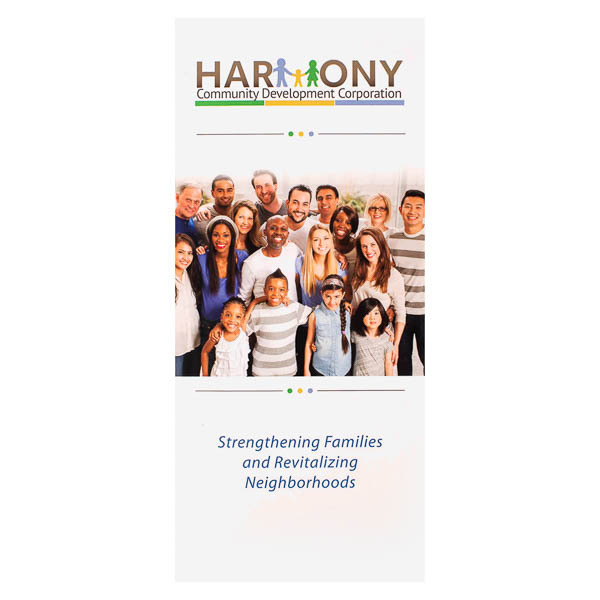 Harmony CDC's cover photo shows some of the families the community development corporation has helped with its economic programs and counseling. White panels look clean and organized. Blue text appears professional and matches the brand's logo, which features pops of warmer color as well. Contact information on the back lets Dallas residents ask about assistance and volunteer roles. Slim outer panels in a 4" x 9" portrait orientation wait for your custom logo and imagery. Inside, the v-split right pocket secures your 3 3/4" x 8 1/2" media, including both tall, narrow documents and letter-size paper folded into thirds. The pocket's placement on the right panel gives your clients an immediate view of your documents as soon as they open the product, making this no-fuss design all the more convenient. The vacant left panel provides the perfect place for extra information about your brand, a stylized version of your logo, or another custom graphic.